Out & Equal is committed to ending employment discrimination for lesbian, gay, bisexual, and transgender employees, believing that people should be judged by the work they do, not by their sexual orientation or gender identity. For more than a decade, Out & Equal has been working with organizations to create places of employment whose cultures embrace the contributions of lesbian, gay, bisexual and transgender employees and those who support them. 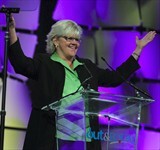 This year's Workplace Summit broke all records with over 2,600 people converging in Dallas. You can hear more than 80 sessions dealing with workplace equality for all. Each session on one CD, includes free binders. Mail order only. Each of the Featured Panels on individual DVD, 11 total. Mail order only. Coaching: What It Is; What It Isn’t - Why Every LGBTQA Leader Should Have A Coach! Approaches to Self-ID in Canada: Deloitte and Xerox - Pilots for US Firms?